Test Connectivity Between iPad, LAN Printer and Payment Terminal – How can we help? If you can't get your receipts to print or get your payment terminal to work from Vend, you may want to first check to see if your iPad can talk to your payment terminal and/or LAN printer over your local internet network. You can do this by using a Ping App which sends a ping request to your payment terminal and/or LAN printer to determine if the given IP address is online or offline. 1. 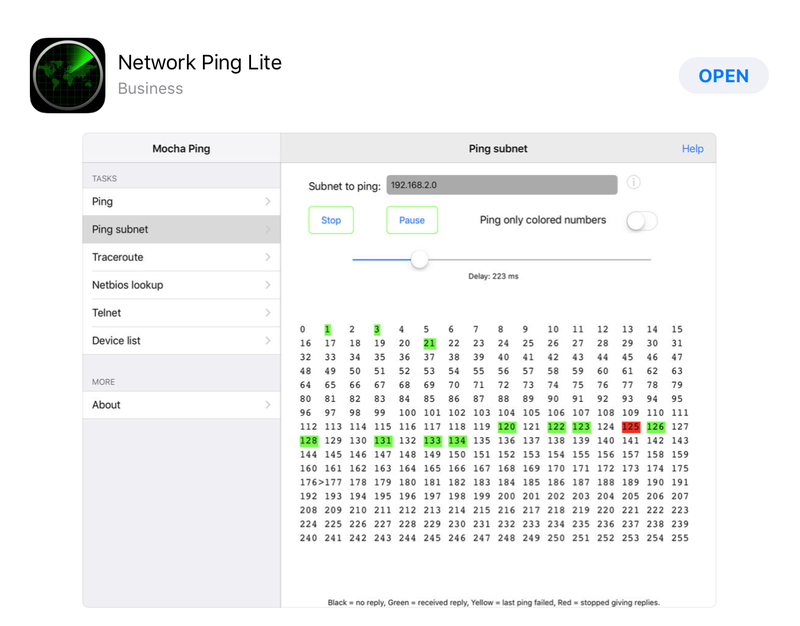 Navigate to the App Store and search for Ping. An example would be Network Ping Lite. 2. Follow the instructions on your payment terminal and/or LAN printer to find the current IP address. 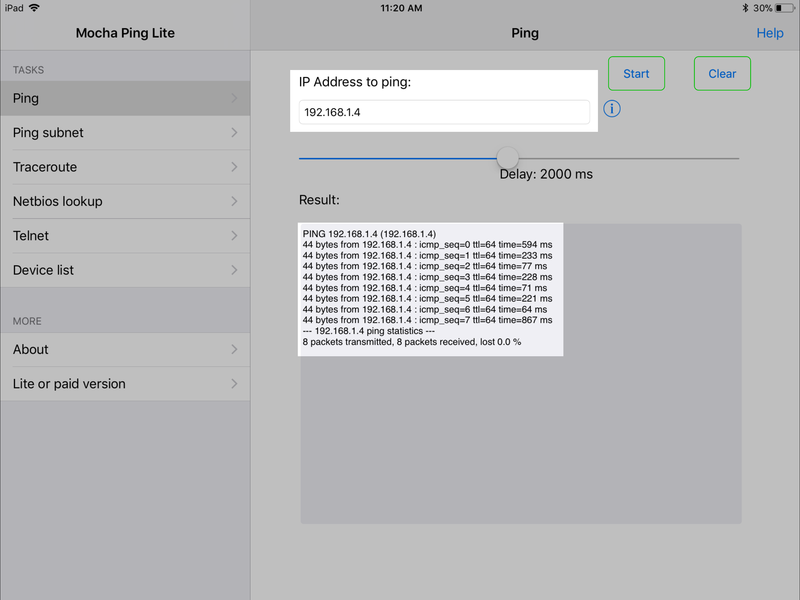 Once the Ping App opens, enter the IP address that you want to check is online and click on Start. If the IP address can be found on the network it will display as the example below. In this example, 8 "packets" were sent and they were all received by your payment terminal and/or LAN printer, meaning the payment terminal and/or LAN printer is Online. If the Ping requests are successful then your payment terminal and/or LAN printer is Online and should be discoverable by your iPad or Computer. If the payment terminal and/or LAN printer cannot be found on the network it will display as the example below. In this example, the request has timed out, as the payment terminal and/or LAN printer never responded to the Ping request. 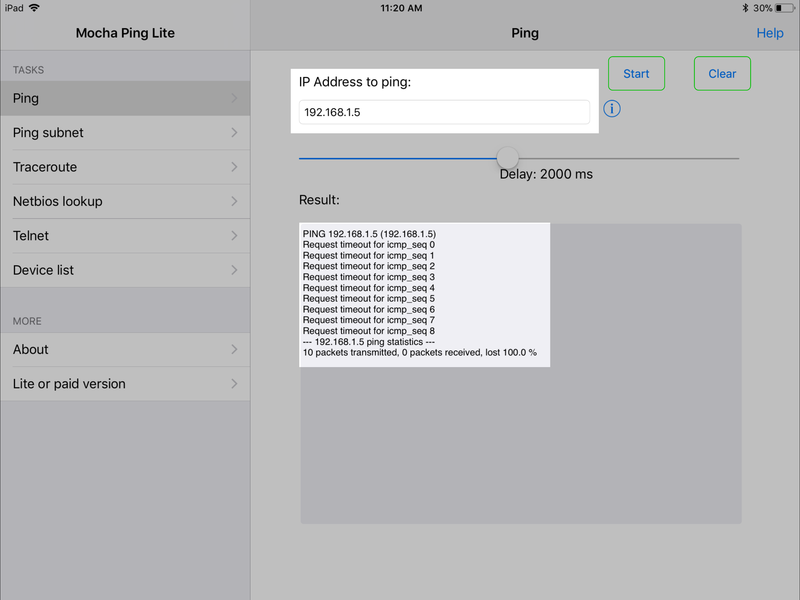 If the Ping requests fail then it is possible there is an issue with the given IP address. One possible explanation is that it has a hard-coded "Static" IP address. In this case, you should reset the payment terminal and/or LAN printer's IP address so it will pick up your current LAN configuration.